As grassroots efforts to confront the legacy of racial injustice in the United States take hold from New Orleans to Maine and beyond, how can transitional justice experiences around the world inform their work? 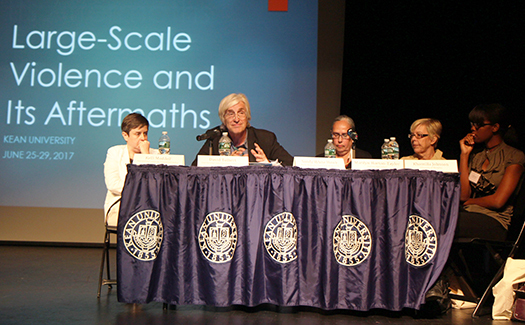 That question was a major focus of a two-day conference titled, "Large Scale Violence and Its Aftermaths the United States and the World," co-convened by ICTJ and hosted by Kean University. The conference was co-organized by the Auschwitz Institute for Peace and Reconciliation and Cardozo School of Law Human Rights and Atrocity Prevention Clinic. Throughout the conference expert panelists assessed historical approaches to dealing with massive human rights breaches and strategized around actions in support of justice and truth-seeking for communities within the United States. “In the United States, we can look at experiences from other places that can be useful to us. It’s not a direct match, but there’s a great deal to be drawn on from other transitional justice and human rights experiences,” ICTJ President David Tolbert explained. He referred to the recent public hearings for torture victims in Tunisia as a positive representation of the impact of truth commissions in advancing institutional acknowledgement of past abuses, as well as the removal of confederate statues in New Orleans as an example of the impact pressure on behalf of civil society can have. The conference was part of a five-day summer institute that brought together a diverse range of professionals in the field of transitional justice. The goal was to establish a clearer understanding of the role of state actors in addressing large-scale violence, as well as to explore what non-state and civil-society actors can do to restore and transform security, historical narratives, and civic trust within societies moving forward. To that end, panels grappled with topics ranging from migration rights and displacement to the experiences of and reparations for indigenous peoples. Discussion also touched on the effect of sexual and gender-based violence – particularly its differing impacts across racial and economic communities– and on the persistent legacy of slavery in institutions throughout the US. ICTJ organized and moderated a panel discussion on transitional justice initiatives that have already taken place in the US, with specific examples from Memphis and Maine that underline the importance of truth-telling and acknowledgement. Kelli Muddell, Director of ICTJ’s Gender Justice Program, moderated the panel. She reflected on how to deal not only with the immediate consequences of massive human rights abuses, but also with their legacies and root causes. “Just because you have legal frameworks that maybe change, you have practices that continue, because people’s minds and biases don’t change,” she said. This point was elaborated on in the context of the Maine Wabanaki-State Child Welfare Truth and Reconciliation Commission in Maine. Sandy White Hawk, one of the commissioners, highlighted the commission’s goal of achieving truth and redress for the Wabanaki people who did not benefit from the Indian Child Welfare Act of 1978. She brought up the issue of “disenfranchised grief” – that is, grief that is politically marginalized – explaining: "We don't forget the past because we are still continuing to recover," she said. She urged collaboration between academics and affected communities in legitimizing oral history and facilitating truth and reconciliation. "You can learn from us because we are still here, living this," she said. Marilyn Horton-Taylor, a high school teacher at Overton High School in Memphis and Khamilla Johnson, a student at the University of Memphis spoke together about their work to help rectify some of their city’s historical narrative as well. The two discussed their project to spread the story of the lynching of Ell Persons in 1917 in Memphis, and to construct a monument in memory of the city's difficult past. The project grew out of Horton-Taylor’s course based on Facing History’s curriculum. Johnson was one of the students who successfully pushed the Memphis community to memorialize Persons’ lynching as a result of the class. She emphasized the importance of informing society about individual instances of racial discrimination as part of acknowledging broader periods of injustice. "To forget that part of history is to forget everyone else that has been affected by it in the past," she said. Tolbert echoed calls for education reform and a need to incorporate victim survivors of violations moving forward. He also highlighted the economic dimension of discrimination within the United States. "There's a huge economic element to the race issue in this country and racial discrimination and abuse," he said, and emphasized its relevance in the current period of mass incarceration. ICTJ also participated in a panel titled “Frameworks for Dealing with the Past,” which examined the degree to which international experience can inform efforts to pursue justice in the United States. In this discussion, David Tolbert stressed the importance of victim participation in the design and implementation of transitional justice processes. "This should be a bottom up process," he said, "a process that's driven by victims, that we hear from the victims, and that we hear from those who have suffered abuses." This approach was supported with discussion of inclusive ways of remembering history. Dina Bailey, CEO of Mountain Top Vision, LLC in Atlanta, Georgia, explained the role of sites of conscience in the United States in this effort, such as museums, historic sites, and memory initiatives that focus on truthfully depicting past massive human rights abuses. "[Museums] are actually becoming more activist," she said, "we are not neutral spaces necessarily anymore, but we are dealing with and figuring out how to deal with a lot of the aftermaths of this contemporary relevance." She noted the importance of “authentic collaborations” in this work, and a need to bridge the efforts of local organizations, individuals of civil society and state actors. Concurring with the use of recognition as a tool for post-violence progress, Elazar Barkan, Professor of International and Public Affairs at Columbia University, spoke about historical dialogue and acknowledgement of the past as a crucial mechanism for transitional justice processes. "Dealing with the past doesn't bring closure, it brings an opening," he said, "It’s an ongoing dialogue." He noted the importance of truth commissions and tribunals in transitional justice, the need to bring the past into contemporary contexts, and the different levels of engagement that are required to achieve justice. Sunday's discussion concluded with a keynote address by Pablo de Greiff, United Nations Special Rapporteur on the Promotion of Truth, Justice, Reparation, and Guarantees of Non-Recurrence. De Greiff spoke of some of the field of transitional justice's accomplishments, including its consolidation as a holistic effort, while also reflecting on its challenges. He highlighted the notion of "isomorphic mimicry," or attempting to apply the same approach to different situations, as among the most problematic. "Most transitional justice work takes places in contexts that are completely different from the contexts that gave shape to the idea and to the model of transitional justice," he warned. De Greiff also addressed some of the most important aspects of the field, stressing guarantees of non-recurrence as the most essential. Dr. Fania E. Davis, Co-Founder and Executive Director of Restorative Justice for Oakland Youth, brought the conference to a close on Monday with her own justice-seeking journey that emphasizes the need for local efforts. She spoke about restorative justice and the integral role that healing processes play in transitional justice practices. "We are redefining what justice is and what it does," she said. "Restorative justice itself is a healing justice." Davis called on a need for society to shift from a "battle ground to a healing ground," and underlined one of the conference's overarching themes of taking a bottom up inclusive approach in transitional justice processes. "When the youth feel welcomed, when the marginalized feel welcomed, then I know that we're onto something," she said. "Whether it's a fourteen-year old or a judge, every voice is important in the space that we create."